and he rented a seriously hot car! I spent the last week in Mougin, near Nice, in the South of France. Though I've been to Europe -- my family is in Yugoslavia and Germany -- France was a first. Here are some interesting things I noticed. - All the men wear hair products. Mousse, I think. Gel? - All the women have long hair down or in loose, messy buns. For once, I don't feel disheveled. - Everywhere, you are either hearing Cole Porter covers (usually Mel Torme) or Supertramp! - The people in the south of France are so totally friendly. This reminds me of the American South, where I grew up -- where it is considered rude not to greet a stranger, anyone and everyone, with a hearty Bonjour or Bon Soir! (When I moved to Boston from Florida, I said Good Morning to people on the street and they literally scattered. Probably assumed I was nuts. - There is a town named Mougin with ancient Roman walls and medieval homes. Art galleries. Bistros. Not a tourist shop in the whole place. Picasso spent his final years there. - It is absolutely gorgeous here. I thought my home now, San Francisco, was the most beautiful place on Earth with its panoramic views and mountains, ocean, Bay. Sorry, SF, but the South of France is SF plus one. - People tip very little here. Literally. I kept being told to leave only a 2 euro coin as a tip for everthing, no matter how much it cost! - WIFI is free everywhere. Even in the ancient towns. - Monaco looks like paradise. You could eat off the streets. You can sit in front of the palace. I have never seen so many Ferraris in my life, in front of the famous casino (the one from all the James Bond movies) in Montecarlo. Literally, 200 Ferraris in a parking lot. - I heard a couple complaining that they were shocked that a restaurant wouldn't serve them dinner after 11! I was surprised they wouldn't even give me an appetizer until 7:15 p.m. I knew they ate late here, but sheesh. - Following on that thought, I woke up early today to take my plane back home (am writing from Nice Airport now) and at 7 a.m. there was not a single person at breakfast. When I left at 8:30, I checked, and still no one had woken up. - Various types of ham, a lot like prosciutto, seem to be the mainstay of most meals. - There is a pizza place on every corner. They love that Italian food, I suppose. I didn't see a single Starbucks and only a sign for a Macdonalds that was "coming soon." Somehow I doubt this. - I speak German and Spanish quite well and guess what, when I couldn't communicate in French with the locals, I found they could speak one or the other, too. - They don't speak fondly of Proust here. That surprised me. - Of course, everyone smokes. Ashtrays everywhere. Coming from California, this looked so surprising to me. But do you know what they are smoking: Marlboro Red. No warning label. - The weather feels a lot like San Diego in early spring. A little brisk. But the palm trees, etc., let you know you're in the Riviera. - All women wear scarves. - People kept calling me Madame. To be honest, I wish they'd said Mademoiselle. - In all, I love it here! I have heard stories about the French being brash, disdainful of those who butcher their language, hating Americans. Maybe in Paris (I have no clue). But not here. Maybe it is the southern thing -- in France or in the US -- that helps make people more relaxed and a whole lot friendlier. - Off to my flight. I'll post some pics. Great guy, a pleasure to meet him. Real midwestern kindness. (nothing worse than doing business with the unkind, as all of you who read this blog know I feel). Anyway, thought I'd put up a pic on request of my dad. Great meetings, great city, great food, great big TVs on street rivaling Times Square by far. It was yesterday, May 31, where Tonia Ries, Harry McCracken and I hosted twtrcon. I'm in green. This is me having a birthday. Better than alternative. Looks like a Venus flytrap! Thank you for this Venus Trap looking flower -- courtesy of my co-worker Jessica Swesey. TWTRCON SF 09, May 31, Hotel Nikko, San Francisco, is the first conference focused on Twitter as a business platform. The thought-provoking program will focus on the powerful business potential of Twitter and case studies of early corporate users. Speakers include rapper/actor MC Hammer, Top 100 Twitterer and investor Guy Kawasaki and Virgin America CKO Porter Gale. Register with promo code CYNC and receive a 20% discount at twtrcon.com. (www.twtron.com The Twitter Conference for Business). A little press! How about that! PR agencies turn out to be the biggest audience for us -- they are struggling to figure out how to use Twitter and other social media for their clients. I'm so lucky to be hosting this. Carl's Jr. (the tweeter, not the burger) is coming to Twtrcon.com! Click on the text inside this post. I am co-hosting the Twitter Conference (twtrcon). I have been twittering about it, but I've yet to put info about it here ... I am co-hosting the Twitter Conference in San Francisco on May 31 at the Nikko. Anyone who reads the blog today can get 20 percent off tickets by using the BDCST promo code. Check it out at http://twtrcon.com. Psyched to be co-hosting the twitter conference here in SF with ModernMedia's Tonia Ries. Hope to see you there! The washing machine is not my liberator. (Reuters). VATICAN CITY (Reuters) - Feminists of the world sit down before you read this. The Vatican newspaper says that perhaps the washing machine did more to liberate women in the 20th century than the pill or the right to work. The submission was made in a lengthy article titled "The Washing Machine and the Liberation of Women - Put in the Detergent, Close the Lid and Relax." The article was printed at the weekend in l'Osservatore Romano, the semi-official Vatican newspaper, to mark international Women's Day on Sunday. "What in the 20th century did more to liberate Western women?," asks the article, which was written by a woman. "The debate is heated. Some say the pill, some say abortion rights and some the right to work outside the home. Some, however, dare to go further: the washing machine," it says. It then goes on to talk about the history of washing machines, starting with a rudimentary model in 1767 in Germany and ending up with today's trendy launderettes where a woman can have a cappuccino with friends while the tumbler turns. Why Woz Could Win Dancing With The Stars! I notice the public IS watching. Our book, iWOZ: How I Invented the Personal Computer and Had Fun Doing it (Norton, 2006) is #2 on Amazon's biographies section! Who wants to see the grandpa of the geeks get up and dance? ABC for starters, as it chose 58-year-old Apple co-founder Steve Wozniak, usually just called "Woz," for the 2009 season of "Dancing With the Stars." The real reason Woz could win is his fans. His qualifications? His 2006 biography is titled "iWoz: Computer Geek to Cult Icon: How I Invented the Personal Computer, Co-founded Apple, and Had Fun Doing it." Pretty much says it all. Light on his feet? While Mr. Wozniak may be a top-notch geek, he lacks the stereotypical skinny build. That is, he's a tank with facial hair. Also described as a "teddy-bear physique." Athletic ability? He's a founding member of the Segway Polo team called the Silicon Valley Aftershocks. Romantic appeal? He's been married four times. Between his third and fourth, he also dated comedian Kathy Griffin and appeared several times on her show "My Life on the D List." Then he later announced their breakup on "The Howard Stern Show." OK, never mind. No, the real reason Woz could win is his fans. Every engineer, software developer, technorati and digerati will be rooting for and, more importantly, voting for the beloved engineer. In fact, since the announcement earlier this week, they've been blogging about how to make it happen, starting with "How can we geeks unite to sway the vote?" posted by Al Lucklow on Woz.org. Mike Cassidy of the San Jose Mercury News, wrote: "Look, Woz has been good to the valley -- his innovation, his philanthropy, his laid-back style. Now it's time for us to be good to him. When the show begins early next month be sure to tune in. And then vote for Woz -- early and often." A suggestion on Digg: "Someone should write a vote for Woz app for the iPhone." And this final rallying cry from Chicago Sun-Times columnist Andy Ihnatko: "I'm determined to use and abuse every resource at my disposal to propel Steve Wozniak -- the Geek Nation's own Falstaff ... into the finals of the competition. Why? Payback, baby. Payback. ... But it's up to our Tribe to grab the ball and run with it. Geeks, nerds, anoraks, and wonks of all faiths and callings: this is our moment! I am absolutely confident when I say that if Woz gets into the finals of 'Dancing With The Stars,' it gives all of us license to actually walk up to a human of the appropriate target gender and talk to him or her. And if he wins ... we might even be able to take the Boba Fett helmet off first." Seminar coverage inevitably leads to the hot tub. The seminar really did have a great pool and hot tub. Now you can see why they call my neighborhood, The Sunset. Okay, abdominal surgery is a major thing. Thanks to Cynthia Landaiche Jones -- first and foremost, because I'm a difficult patient -- and Henry, Keith Prewitt, Eric and Patchita, I am fast on the way to recovery. And off the Vicodin, for all of you who surely doubt it. Boarding school roomates -- years later. It was like no time had passed. Here's Skimbo (aka Cynthia Landaiche Jones) and me in San Francisco after she came out for a visit. She stayed for two weeks.The last time I saw her, we were teenagers. Here we were yesterday. p.s. We were boarding school roomates at Woodward Academy, in Atlanta, GA. I live in San Francisco now, but in Volusia County (Daytona/Deltona/Ormond etc.) the pipe is law. Yikes. From my hometown paper, The Daytona Beach News Journal. DELTONA, Fla. - An angry Deltona father whacked his teenage daughter's boyfriend with a metal pipe after finding the boy naked in his daughter's room. Authorities say the father, 45, didn't even know his daughter had a boyfriend or that the youngster had been sneaking into the home for more than a year. Are you a yankee or from dixie? Growing up in northeast Florida, we called anyone who lived north of the Mason-Dixon a "yankee." Not a derogative term. But a descriptive one. But I left the south for a job at PC Week in Boston, and later lived in Manhattan and now, in San Francisco. So I thought it was fun to take this test. I guess it makes sense I'm only 55 percent Dixie now. David Schiffman, Dr. Ruth Richards, me and drummer Sal Nunez. Having fun in graduate school. So, to Wacky Packages, I can only say: Thank you. 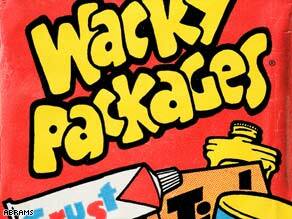 At their 1973-75 zenith, Wacky Packages were a phenomenon. The stickers made the cover of a 1973 issue of New York magazine (by coincidence, the same issue included an article on Mad, then at its Nixon-roasting height), and were also written about in The New York Times and Philadelphia Inquirer. Lynch remembers Wackies outselling baseball cards one year. This was before satire became a national industry," Lynch recalls. "It wasn't like, every day, a thousand people would mock Tide." Interesting and alarming article in today's Sunday NYT. While in Florida most of June and July, I was stung by jellyfish about a dozen times. Excerpt from article below. A jellyfish in the Mediterranean off the coast of the Spanish island of Mallorca. BARCELONA, Spain — Blue patrol boats crisscross the swimming areas of beaches here with their huge nets skimming the water’s surface. The yellow flags that urge caution and the red flags that prohibit swimming because of risky currents are sometimes topped now with blue ones warning of a new danger: swarms of jellyfish. Jellyfish at the Institute of Marine Sciences in Barcelona, Spain. Jellyfish have recently been turning up in places where they once were rarely seen, scientists say. In a period of hours during a day a couple of weeks ago, 300 people on Barcelona’s bustling beaches were treated for stings, and 11 were taken to hospitals. From Spain to New York, to Australia, Japan and Hawaii, jellyfish are becoming more numerous and more widespread, and they are showing up in places where they have rarely been seen before, scientists say. The faceless marauders are stinging children blithely bathing on summer vacations, forcing beaches to close and clogging fishing nets. But while jellyfish invasions are a nuisance to tourists and a hardship to fishermen, for scientists they are a source of more profound alarm, a signal of the declining health of the world’s oceans. “These jellyfish near shore are a message the sea is sending us saying, ‘Look how badly you are treating me,’ ” said Dr. Josep-María Gili, a leading jellyfish expert, who has studied them at the Institute of Marine Sciences of the Spanish National Research Council in Barcelona for more than 20 years. The explosion of jellyfish populations, scientists say, reflects a combination of severe overfishing of natural predators, like tuna, sharks and swordfish; rising sea temperatures caused in part by global warming: and pollution that has depleted oxygen levels in coastal shallows. These problems are pronounced in the Mediterranean, a sea bounded by more than a dozen countries that rely on it for business and pleasure. Left unchecked in the Mediterranean and elsewhere, these problems could make the swarms of jellyfish menacing coastlines a grim vision of seas to come. Jellyfish, relatives of the sea anemone and coral that for the most part are relatively harmless, in fact are the cockroaches of the open waters, the ultimate maritime survivors who thrive in damaged environments, and that is what they are doing. Within the past year, there have been beach closings because of jellyfish swarms on the Côte d’Azur in France, the Great Barrier Reef of Australia, and at Waikiki and Virginia Beach in the United States. In Australia, more than 30,000 people were treated for stings last year, double the number in 2005. The rare but deadly Irukandji jellyfish is expanding its range in Australia’s warming waters, marine scientists say. While no good global database exists on jellyfish populations, the increasing reports from around the world have convinced scientists that the trend is real, serious and climate-related, although they caution that jellyfish populations in any one place undergo year-to-year variation. “Human-caused stresses, including global warming and overfishing, are encouraging jellyfish surpluses in many tourist destinations and productive fisheries,” according to the National Science Foundation, which is issuing a report on the phenomenon this fall and lists as problem areas Australia, the Gulf of Mexico, Hawaii, the Black Sea, Namibia, Britain, the Mediterranean, the Sea of Japan and the Yangtze estuary. In Barcelona, one of Spain’s most vibrant tourist destinations, city officials and the Catalan Water Agency have started fighting back, trying desperately to ensure that it is safe for swimmers to go back in the water. Each morning, with the help of Dr. Gili’s team, boats monitor offshore jellyfish swarms, winds and currents to see if beaches are threatened and if closings are needed. They also check if jellyfish collection in the waters near the beaches is needed. Nearly 100 boats stand ready to help in an emergency, said Xavier Duran of the water agency. The constant squeal of Dr. Gili’s cellphone reflected his de facto role as Spain’s jellyfish control and command center. Calls came from all over. Officials in Santander and the Basque country were concerned about frequent sightings this year on the Atlantic coast of the Portuguese man-of-war, a sometimes lethal warm-water species not previously seen regularly in those regions. Farther south, a fishing boat from the Murcia region called to report an off-shore swarm of Pelagia noctiluca — an iridescent purplish jellyfish that issues a nasty sting — more than a mile long. A chef, presumably trying to find some advantage in the declining oceans, wanted to know if the local species were safe to eat if cooked. Much is unknown about the jellyfish, and Dr. Gili was unsure. Another Florida pic ... that hot sun. PETA is seizing the international spotlight of the Summer Olympics to help animals by exposing the nightmarish conditions for dogs, cats, and other animals who are unlucky enough to be on Chinese fur farms. China is one of the world's largest suppliers of animal fur. More than 95 percent of China's finished fur garments are exported for sale overseas, and much of it is sold in North America. The video footage from PETA's undercover investigations on Chinese fur farms have revealed that dogs—including German shepherds and golden retrievers—and defenseless tabby and Siamese cats were strung up by their legs or tails and skinned alive. Their fur is often labeled as "Asian jackal," "rabbit," or "raccoon" fur and sold to unwitting consumers around the world. If someone feels uncomfortable wearing the skin of a kitten or a puppy, they should certainly be uncomfortable wearing the skins of rabbits, raccoons, and other animals. As our undercover video footage reveals, the suffering of dogs, cats, and other animals in China's fur industry is extreme. After spending their lives crammed together in filthy, homemade wire-mesh cages, they are thrown onto trucks and bludgeoned, poisoned, electrocuted, or even boiled alive before their skin is ripped off their bodies. Some animals in the video footage are still conscious and look up at the camera while they are skinned. I hope that you will make a donation to PETA to help our work for animals who are caught up in China's wretched fur industry. Please help us push harder with our global campaign to stop the torture of animals for their fur. The support of caring individuals like you is the best hope for ending this horrific industry. As you know, there is absolutely no acceptable use of animal fur in our society: not for jackets, hats, boots, purses, glove linings, trinkets, cat toys, consumer vanity, or corporate greed. Killing animals for their skin is repugnant, intolerable, and cruel. Yet the slaughter of innocent animals continues. But working together, we can save millions of individual animals in China and around the world from suffering. Because of supporters like you, PETA has been able to reduce the suffering of so many animals already. We've convinced some of the world's leading designers and retailers—including Calvin Klein, Tommy Hilfiger, Polo Ralph Lauren, and Ann Taylor—to adopt permanent no-fur policies, and countless people have agreed to stop wearing and buying fur. But we have much, much more to do before all animal suffering for the sake of fashion ends. Please help us devastate this industry, which thrives on animal misery. will turn up the heat on the Chinese government to close these cruel fur farms and auctions, and it will help convince more people all over the world to say "No" to fur forever. Thank you for standing up for animals' rights. about Mister Rogers. (thanks to Mental Floss). 1. Even Koko the Gorilla loved him. Most people have heard of Koko, the Stanford-educated gorilla who could speak about 1000 words in American Sign Language, and understand about 2000 in English. What most people don't know, however, is that Koko was an avid Mister Rogers' Neighborhood fan. As Esquire reported, when Fred Rogers took a trip out to meet Koko for his show, not only did she immediately wrap her arms around him and embrace him, she did what she'd always seen him do onscreen: she proceeded to take his shoes off! 2. He made thieves think twice. According to a TV Guide piece on him, Fred Rogers drove a plain old Impala for years. One day, however, the car was stolen from the street near the TV station. When Rogers filed a police report, the story was picked up by every newspaper, radio and media outlet around town. Amazingly, within 48 hours the car was left in the exact spot where it was taken from, with an apology on the dashboard. It read, "If we'd known it was yours, we never would have taken it." 3. He watched his figure to the pound. In covering Rogers' daily routine (waking up at 5 a.m.; praying for a few hours for all of his friends and family; studying; writing, making calls and reaching out to every fan who took the time to write him; going for a morning swim; getting on a scale; then really starting his day), writer Tom Junod explained that Mr. Rogers weighed in at exactly 143 pounds every day for the last 30 years of his life. He didn't smoke, didn't drink, didn't eat the flesh of any animals, and was extremely disciplined in his daily routine. And while I'm not sure if any of that was because he'd mostly grown up a chubby, single child, Junod points out that Rogers found beauty in the number 143. According to the piece, Rogers came "to see that number as a gift... because, as he says, "the number 143 means 'I love you.' It takes one letter to say 'I' and four letters to say 'love' and three letters to say 'you.' One hundred and forty-three." 4. He saved both public television and the VCR. Strange but true. When the government wanted to cut public television funds in 1969, the relatively unknown Mister Rogers went to Washington. Almost straight out of a Frank Capra film, his 5-6 minute testimony on how TV had the potential to give kids hope and create more productive citizens was so simple but passionate that even the most gruff politicians were charmed. While the budget should have been cut, the funding instead jumped from $9 to $22 million. Rogers also spoke to Congress, and swayed senators into voting to allow VCR's to record television shows from the home. It was a cantankerous debate at the time, but his argument was that recording a program like his allowed working parents to sit down with their children and watch shows as a family. 5. He might have been the most tolerant American ever. Mister Rogers seems to have been almost exactly the same off-screen as he was onscreen. As an ordained Presbyterian minister, and a man of tremendous faith, Mister Rogers preached tolerance first. Whenever he was asked to castigate non-Christians or gays for their differing beliefs, he would instead face them and say, with sincerity, "God loves you just the way you are." Often this provoked ire from fundamentalists. 6. He was genuinely curious about others. Mister Rogers was known as one of the toughest interviews because he'd often befriend reporters, asking them tons of questions, taking pictures of them, compiling an album for them at the end of their time together, and calling them after to check in on them and hear about their families. He wasn't concerned with himself, and genuinely loved hearing the life stories of others. And it wasn't just with reporters. Once, on a fancy trip up to a PBS exec's house, he heard the limo driver was going to wait outside for 2 hours, so he insisted the driver come in and join them (which flustered the host). On the way back, Rogers sat up front, and when he learned that they were passing the driver's home on the way, he asked if they could stop in to meet his family. According to the driver, it was one of the best nights of his life -- the house supposedly lit up when Rogers arrived, and he played jazz piano and bantered with them late into the night. Further, like with the reporters, Rogers sent him notes and kept in touch with the driver for the rest of his life. 7. He was color-blind. Literally. He couldn't see the color blue. Of course, he was also figuratively color-blind, as you probably guessed. As were his parents, who took in a black foster child when Rogers was growing up. 8. He could make a subway car full of strangers sing. Once while rushing to a New York meeting, there were no cabs available, so Rogers and one of his colleagues hopped on the subway. Esquire reported that the car was filled with people, and they assumed they wouldn't be noticed. But when the crowd spotted Rogers, they all simultaneously burst into song, chanting "It's a beautiful day in the neighborhood." The result made Rogers smile wide. 9. He got into TV because he hated TV. The first time he turned one on, he saw people angrily throwing pies in each other's faces. He immediately vowed to use the medium for better than that. Over the years he covered topics as varied as why kids shouldn't be scared of a haircut, or the bathroom drain (because you won't fit! ), to divorce and war. 10. He was an Ivy League dropout. Rogers moved from Dartmouth to Rollins College to pursue his studies in music. 11. He composed all the songs on the show, and over 200 tunes. 12. He was a perfectionist, and disliked ad libbing. He felt he owed it to children to make sure every word on his show was thought out. 13. Michael Keaton got his start on the show as an assistant. He helped puppeteer and operate the trolley. 14. Several characters on the show are named for his family. Queen Sara is named after Rogers' wife, and the postman Mr. McFeely is named for his maternal grandfather who always talked to him like an adult, and reminded young Fred that he made every day special just by being himself. Sound familiar? It was the same way Mister Rogers closed every show. 15. The sweaters. Every one of the cardigans he wore on the show had been hand-knit by his mother. Ok, not exactly. But as promised, I'm showing you the pics from my vacation and its wildlife. This is a small chameleon, just like the ones I grew up with. That trip sure was a flashback to my Florida childhood. But still! So glad to be in San Francisco! If this lizard below isn't king, forgive the exaggeration. Check him out. I'm proud of this picture because it isn't easy getting to close to wary reptiles in Florida. I took so many pictures of this one blue heron -- he/she hardly left this place near the beach where I came down every morning. I'm finally back in San Francisco with decent wireless access and the ability to post something. And finally, I can only hope, my tan will fade so I won't look like some sun-crazed, sun-damaged tourist. But here is what I looked like before I left yesterday. Tomorrow I am returning from 22 days in Florida, my home state, back to my home for the last decade or so in California. I can't wait. When I'm back, I'll be posting some incredible pictures I took of blue herons and the other beautiful birds at this bird sanctuary, where I am staying. I might even post a photo or two of an extremely unhealthy and incredibly dark tan. It reminds me of my childhood. Also, if anyone of you are Alan Watts' fans (and if you're not, read everything you can by this genius), I'd love to hear from you. For my grad school project, I will be writing an essay on spontaneity and fun. There are 1,515 Gina Smiths. Click here. That's my new twitter address. Twitter away, if you can stand it. In just a couple of hours, I'll be on a 12-hour flight to Seoul. I'm hosting a panel of esteemed doctors and researchers in aging, cancer research, genomics and stem cell technology. Al Gore, Tim Draper, Scott Page, John Dvorak, Ken Rutkowski (who is hosting), are just a few of the American contingent going along for the ride. Dr. Aubrey de Grey from the UK will be there, too. This will be a big deal. I'll blog and photo-file if the Internet access is alright. Until then, kamsamhamnida. (phonetic spelling). Okay. I know all the arguments for and against our constitutional rights to bear arms. But now I think guns should be illegal PRECISELY because of idiots like this one, featured in the story below. I was on the fence with gun laws, until this awful, awful story came out today. My feelings for the mother. I hope the father goes directly to jail and does not pass go. Click here if you can stand it. My little boy lost his first tooth today. A day that will live on in history. Today, a month to the day before his fifth birthday, the first bottom tooth exits. Enter the tooth fairy. About the photo on this page, David Winer took this photo of me at a wonderful party held by tech elitinia Sylvia Paull at her new condo last night. Winer is a revolutionary in blogging, and if you've never heard of him (which I doubt), check out his blog, Scripting News. It's linked on my Beautiful Blogs page. 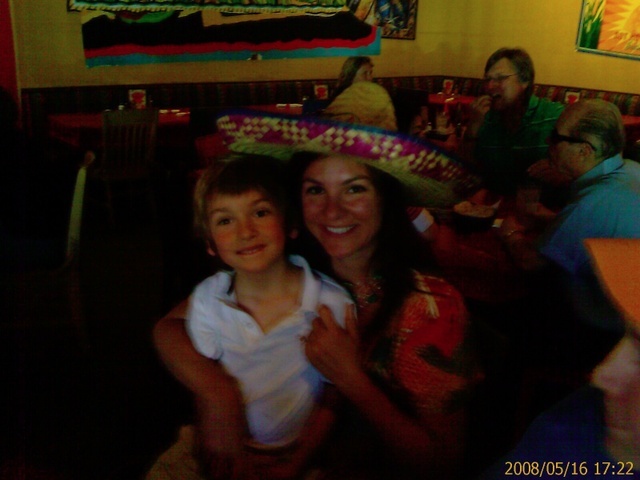 Forgive me the goofy hat. I have a big story running here today. It's about the Top 10 Unsung Innovators in High Tech. Moderating pioneers at the Computer Museum. Last night, I had a blast moderating a panel of tech pioneers at the Computer Museum here in Silicon Valley. It was in celebration of the Nov. 22, 1977 experiment when several companies and gov't agencies managed to plug ARPANET, satellite and packet radio connections together. A true Internetwork -- or Internet. They even had the original SRI radio van there! If Vint Cert, Bob Kahn and the rest had worn 77 clothes, the night would have been complete. Click here for my InfoWorld video highlighting the coming week's news. ... pin-up journalist? Ha! You see what taking four years off to have a baby and write a couple of books will do to your reputation. See this in today's ValleyWag. I don't know whether to be insulted or flattered. Been gone at a residential orientation for my grad school. Going for a PhD finally --in pychology. It'll take a million years, so don't expect tons of updates. But I'm back online, and wanted to share a poem Steve Wozniak sent to me today. (I'd seen it before and had given up on ever finding it again.) BTW, did anyone see Ryan Seacrest NOT recognize Steve at the Emmys? Clueless in Hollywood. Anyway, our book -- iWOZ -- is selling great in several countries, and it's going paperback next month. In which you fill in a form by filling it out, and in which an alarm goes off by going on. And, in closing, if Father is Pop, how come Mother is not Mop? Peter Frampton -- better guitarist than ever. I saw Peter Frampton play tonight in Saratoga (Mountain Winery) and it was breathtaking. Clearly, 32 years of practicing since his virtuoso Frampton Comes Alive has paid off. If anyone out there reading this saw this performance, I would love to hear what you think. He played all the hits, of course, but also some incredible instrumentals from his new material, an unbelievable version of Do You Feel Like We Do, a Humble Pie hit that dwarfs the old and he ended, appropriately to a standing ovation, with George Harrison's While My Guitar Gently Weeps. If anyone out there has videos or photos of this, please send along. This isn't an old hit maker rehashing the past. I have never seen a more incredible performance (and that includes a small Boston performance of The The.) If you thought young Peter was amazing in his 70s work, you will be impressed and amazed at how this guitar genius has managed to improve his skills 100-fold. Thank you to Sheri Little for selling me her tickets. Holy cow. Before and after, everyone in the crowd was grinning from ear to ear. Tomorrow, I'll include a link to his newest instrumental album. I don't believe there is a better guitarist in the world right now. Someone try to prove me wrong. The tornado I saw in Florida recently. People are always asking where I grew up. It was a city called Ormond Beach, Florida. Here's a great, short page that details the bizarre, white sand hamlet where I grew up. These days, I live in San Francisco. But as Wolfe said, you never really can go home again. I always wanted to know how to easily and not-too-disgustingly make compost. Dr. Weil explains on his site today, excerpted below. In a sheltered spot in your backyard, simply layer kitchen vegetable waste in a pile with garden clippings. Or, create the compost in a metal or plastic garbage can - remove the bottom of the can and puncture holes in the sides, and raise the can off the ground (for ventilation). Keep your compost moist, and turn the pile occasionally. In six to eight months, you'll have beautiful, black, organic compost to add to the garden. Use only vegetable scraps and garden clippings (no meat scraps) to keep the compost odor-free and pest-free. Make sure you're composting regularly so you'll always have plenty of material to nourish the soil in your garden and promote moisture retention. Top 10 green cleaning products. I found a site that lists the top ten green (eco-friendly) cleaning products. Happy to see I'm already using four of 10 of them. Click here for that. Our family here in Ft. Myers. I don't think I've blogged this, but I've been in Ft. Myers Beach, FL, for the last two weeks for a Schaefer family reunion. (That's Henry's family.) I'm at the extreme upper camera left. Three generations of Germans (except me, the Yugoslav Smith). Buddhist monks put a whole new spin on the runner's high I just happen to be enjoying right now. Click on this story -- blog post from The Final Sprint.